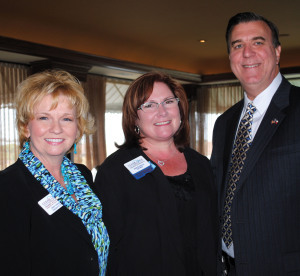 Clear Lake Area Chamber President Cindy Harreld, left, and Chamber Chairman Sharon Proulx welcome new State Rep. Dennis Paul to the Chamber Government Affairs Committee Luncheon at Landry’s Seafood Restaurant on the Kemah Boardwalk to discuss the upcoming Texas Legislature session. Buy Into Bay Area – being spearheaded by the Clear Lake Area Chamber — is launching throughout Bay Area Houston, an initiative that encourages citizens not only to buy local but think local. The mission of the campaign is to expand economic focus beyond businesses to promote the full range of what the community has to offer, including healthcare facilities, volunteer opportunities, education options and much more. Along with hundreds of neighborhood retail centers, hotels, resorts and B&Bs for both corporate and leisure lodging, the Bay Area also provides unique entertainment with Space Center Houston and the Kemah Boardwalk. There are 60 places of worship, a four-year university, major hospitals and medical facilities, 300+ nonprofit and charity groups, plus beautiful parks and nature preserves. “Whatever you seek, Bay Area Houston is sure to provide as it continues to grow. Always give someone local a chance,” said Jamieson Mackay, 2012-14 chamber chairman. 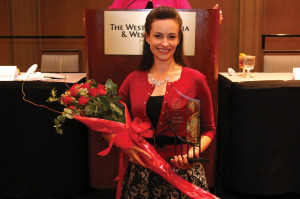 Michelle Hundley, vice president of the Economic Alliance Houston Port Region, with her Houston Women’s Conference Top 25 Business Women Award. Michelle Hundley, vice president of the Economic Alliance Houston Port Region, was honored as one of Houston’s Top 25 Business Women Nov. 12 at the Houston Women’s Conference. “Michelle is an astute business woman whose strength is her fearless ability in creating and maintaining meaningful relationships with regional stakeholders that influence the successfulness of our business,” said Chat Burke, president and CEO of the Economic Alliance. Sudie’s Seafood House in League City, known for its tasty fried catfish, has closed due to the health of its owner, who has put the property up for sale. Clay Bailey said his father’s health was the reason the family was closing the restaurant and laying off its two dozen employees. He plans to run the Sudie’s in Pasadena. 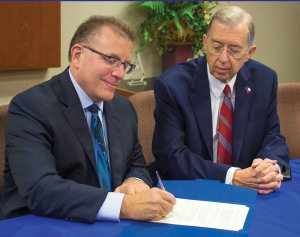 New Texas Chiropractic College President Dr. Brad McKechnie, left, goes over plans for the coming year with TCC Board of Regents Chairman Dr. Monte Blue. The Texas Chiropractic College Board of Regents has named Dr. Brad McKechnie as the institution’s 14th president, after serving as the interim president since April 2014. An honor graduate of TCC in 1985, Dr. McKechnie returned to his alma mater as an assistant professor in the department of clinical sciences. He also twice served as a dean during his tenure, managing postgraduate education and later overseeing external affairs for the college. In 2009, Dr. McKechnie was named to the TCC Board of Regents and he served on the Board’s Academic Affairs Committee, Postgraduate Committee, and the Finance Committee. Burlington, a leading national off-price retail chain, plans to open a new 55,000-square-foot store in Pasadena next fall, bringing about 50-100 new jobs to the community. The new store, one of 53 Burlington locations in Texas, will be located at SH8 and Crenshaw Road. 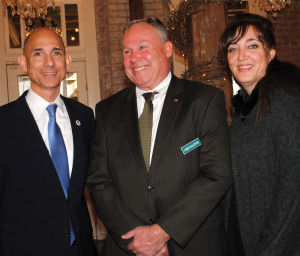 League City Chamber President Laurie Baldwin and Legislative Affairs Committee Chairman Chris Maginnis, center, thank State Rep. Dr. Greg Bonnen for updating chamber members on security problems at the U.S.-Mexican border during a breakfast meeting at Butler’s Courtyard. Top Golf is building a three-story structure on the east side of the Gulf Freeway in Webster, just south of Academy Sports and Outdoors and expects to hire about 450 permanent employees. Its opening is scheduled for summer 2015.